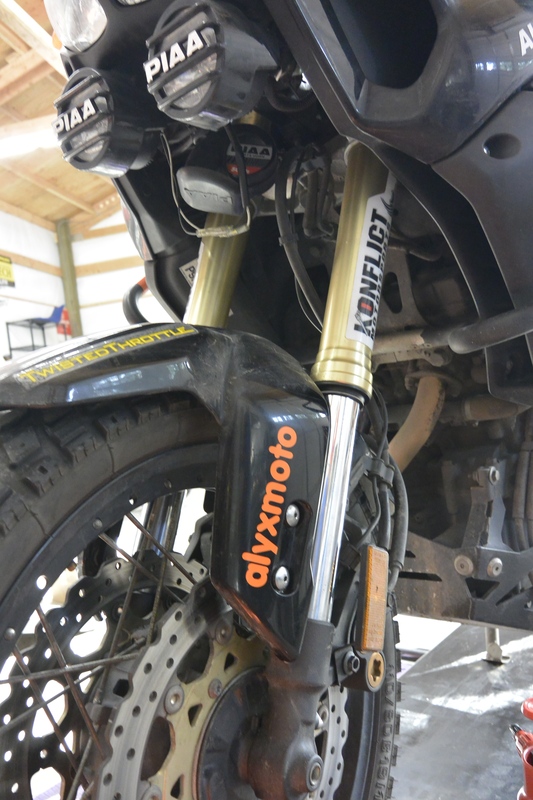 Here in the Pacific Northwest, we have access to some incredibly talented motorcycle craftsmen, whether it’s Darryl VanNieuwenhuise’s Cyclops Adventure lights, Alex Marten’s Konflict Suspension or Alex Guth of Alyxmoto. OK, you might ask, who is Alex Guth? 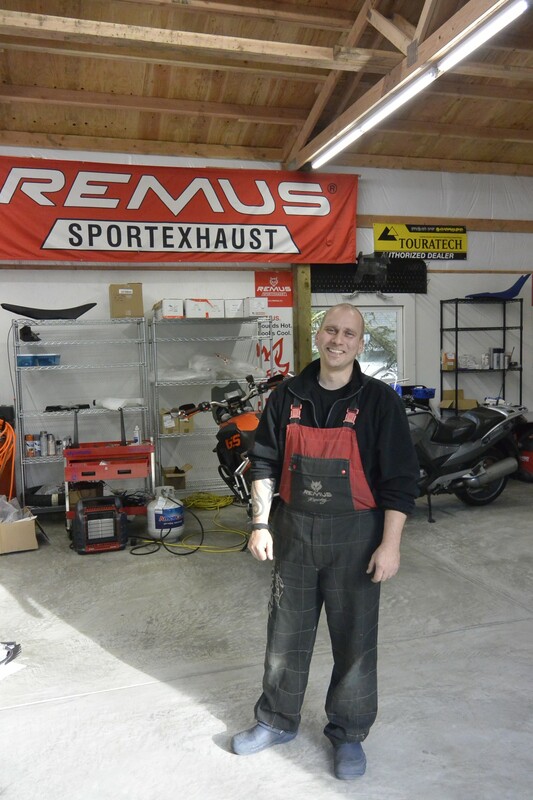 Well, Alex is a master motorcycle mechanic who moved here from Germany in the late 90s. 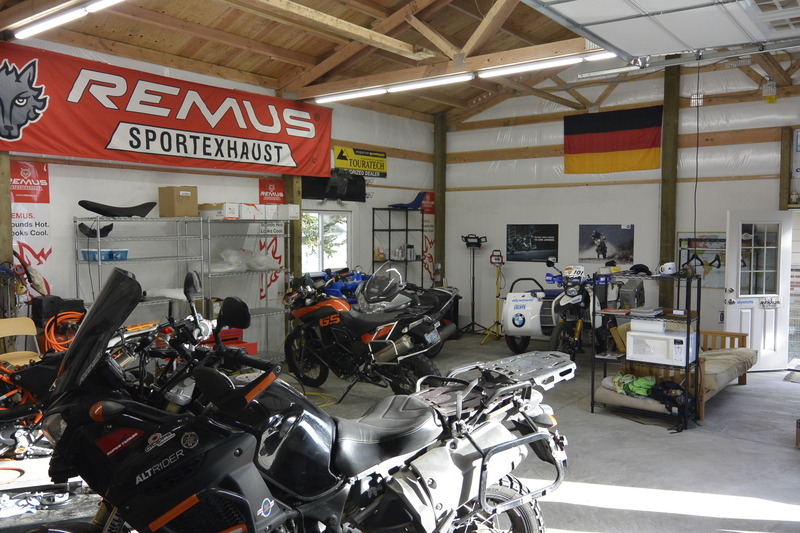 He has 25 years of experience working on BMW motorcycles, and for a time was the shop manager of SSBMW. 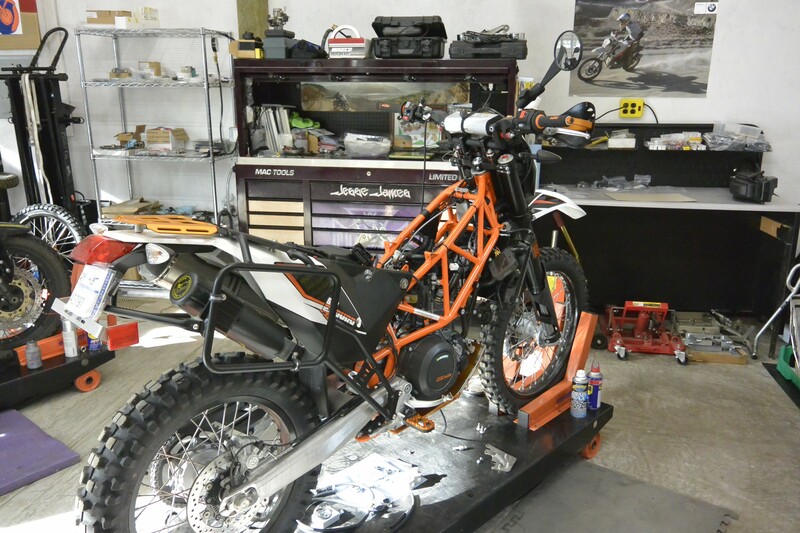 But now he’s in his own shop, and he’s expanding into more of the adventure market like KTM and our Yamaha Super Tenere. 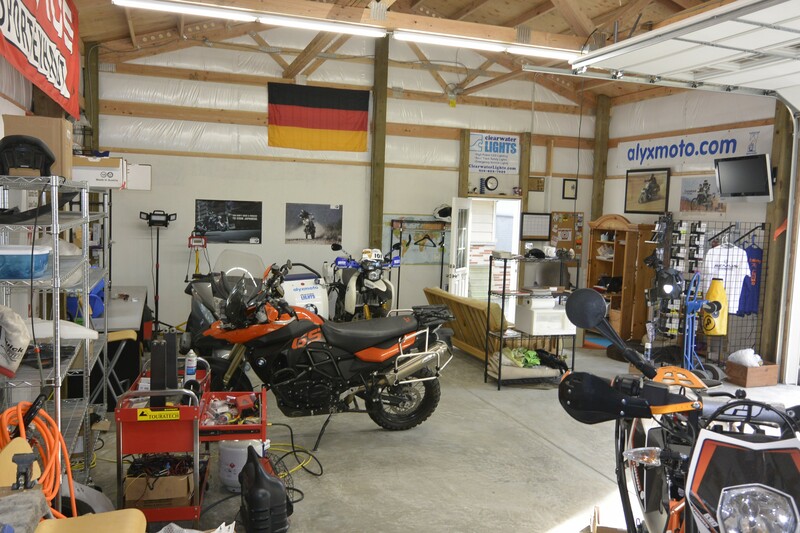 I know one BMW GS owner in particular who travels all the way from Alberta Canada just to get his bike worked on by Alex. 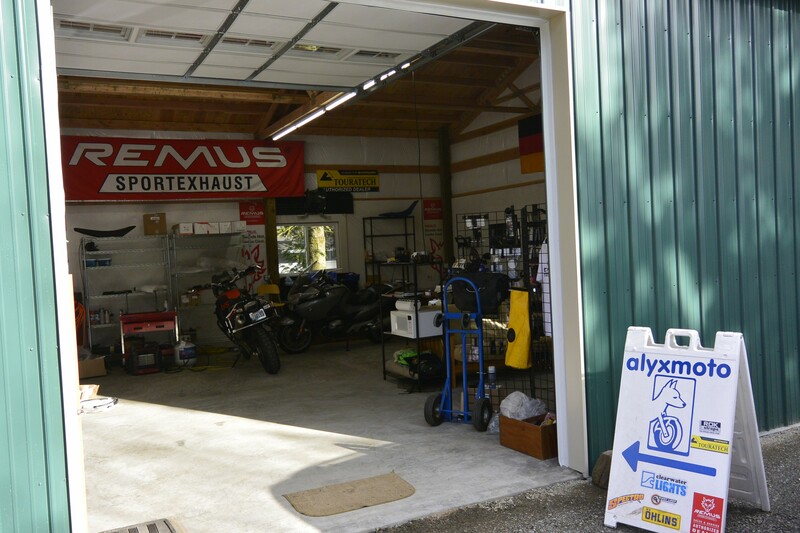 Alyxmoto is where world travelers like Simon and Lisa Thomas of http://www.2ridetheworld.com stop to get their bikes worked on. Alex rebuilt Lisa’s older F-650GS from the ground up (after 200+K miles on a single cylinder; it needed it), and when Simon’s 1150GS’s final drive exploded on a Seattle freeway at 60MPH, Alex had him back on the road in minimal time, so the couple could get to a presentation in Boise Idaho. 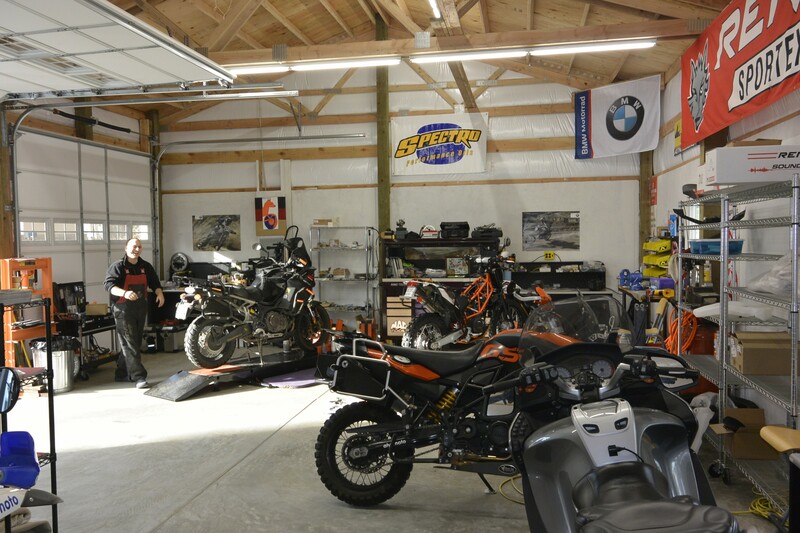 Helge Pedersen’s http://www.globeriders.com tour members’ bikes get tuned up here before getting packed in the container to head out on their globetrotting journeys. 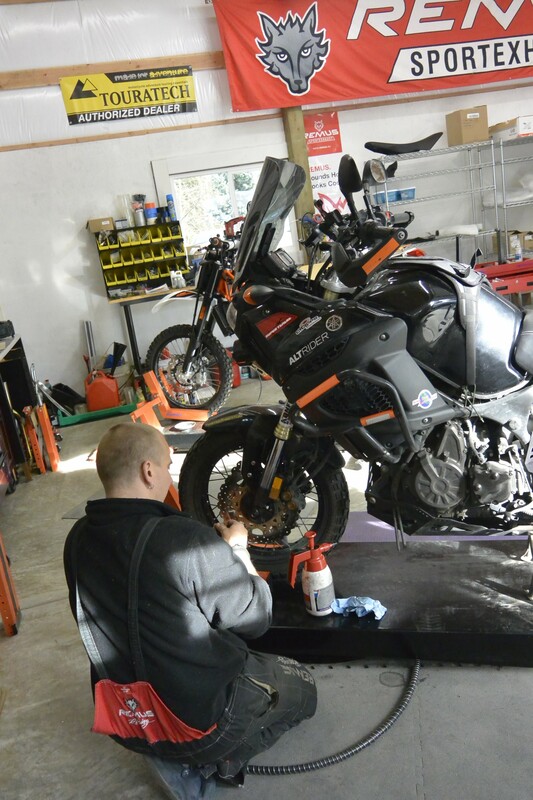 I had Alex do a simple tune up of new spark plugs, air filter, wheel bearings, rear brake disk and new tires (Mitas MC-60’s). I only do my own oil changes, because that’s about the limit of my mechanical patience, and a limitations of not having an actual garage at my house. 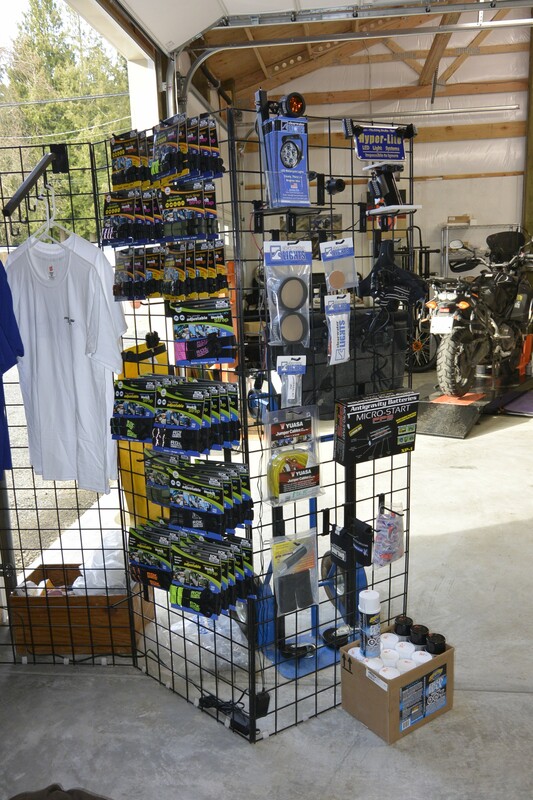 Alex is still working on getting a steady supply of Yamaha parts, so I showed up with all the parts and had him install them. It’s great to have Alex available in the area. 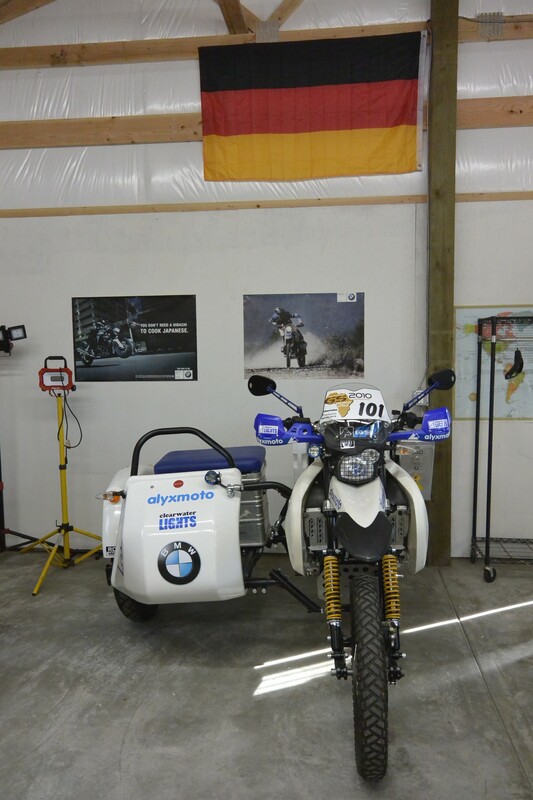 I know several of our members have spouses that ride BMWs (mine included: Elsa gets her G-650GS low serviced by Alex). Alyxmoto can be everyone’s one-stop shop. Alex is the right guy with the know-how to get you set up for a long journey or just your daily commute, so give him a call if you need anything done. He really knows his stuff! I’ve had the pleasure of taking my bike to Alex. 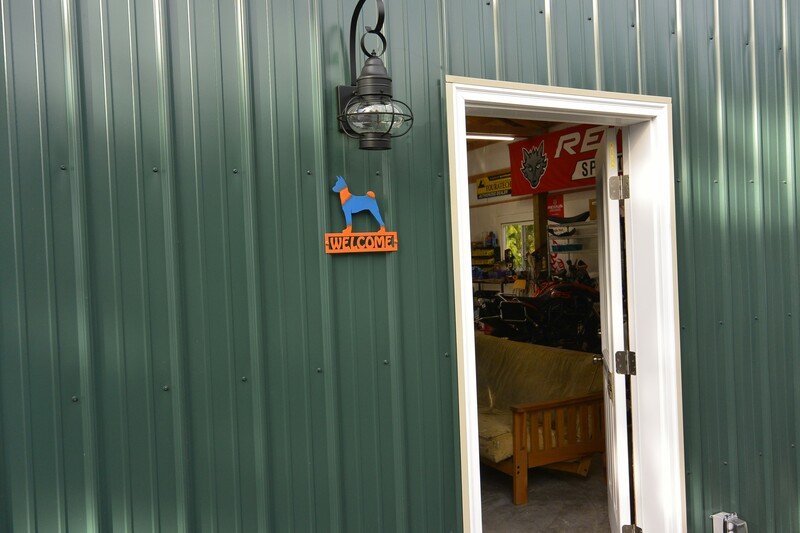 He is a skilled mechanic and is meticulous with his work. I’ve also found him to be an honest and trustworthy businessman as well as an engaging person in general. 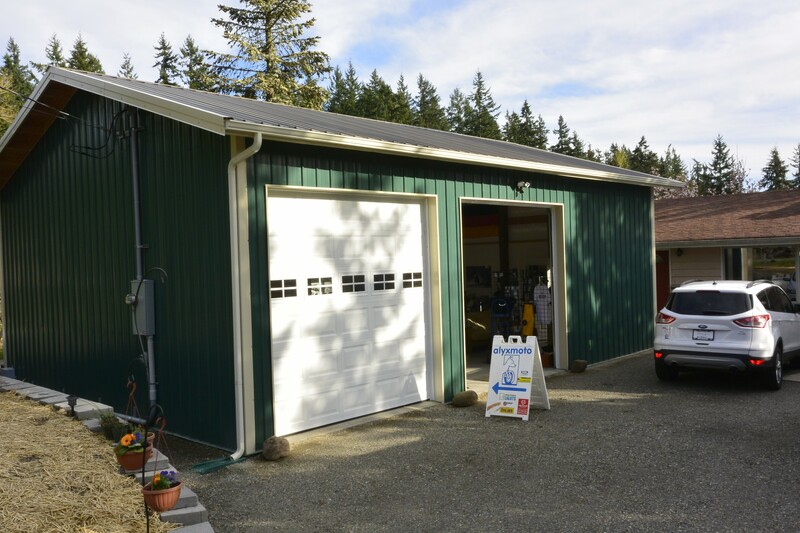 For all these reasons, it’s worth it to me to travel 50 miles to his shop for service. Please consider giving Alex your business. 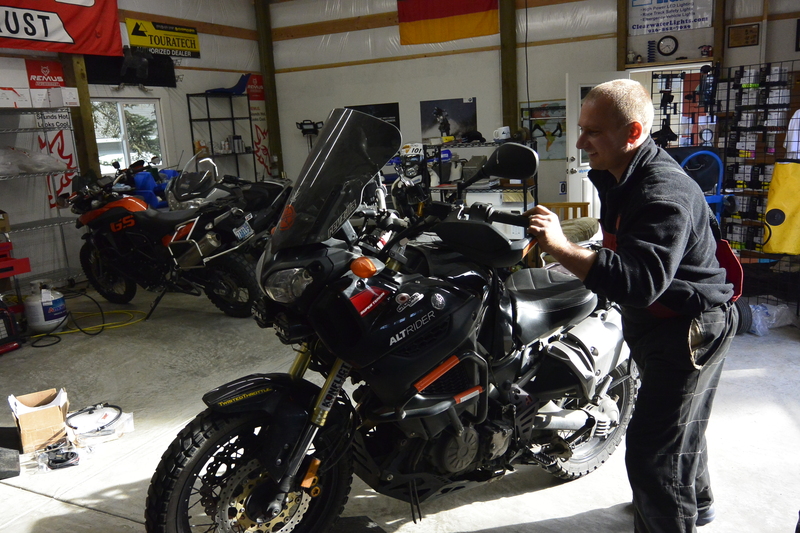 Also, if you are attending the Touratech Rally, Alex will be there to help with bike issues.